It is with heavy hearts that we share news of the passing of, Thomas Elmer Bowles, 72, beloved husband, father and pawpaw for two generations of grandchildren. 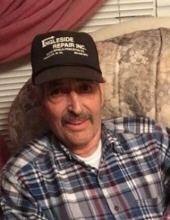 Tommy passed peacefully, surrounded by his loving family in the home that he built decades ago in Avondale, WV on Monday, February 4, 2019. Tommy was born August 27, 1946 in Iaeger, WV, a son of the late Jasper and Nellie Bolden Bowles. He called the beautiful West Virginia mountains his home for his entire life and was a retired coal miner. Tommy was regarded as an avid outdoorsman and loved working, riding four wheelers, hunting and fishing. Tommy is preceded in death by his parents, Jasper and Nellie Bowles, siblings, Kenny Bowles, Jasper Bowles Jr. and Betty Lockey. Survivors include his wife of 50 years, Betty Justice Bowles of the home; siblings, Bob Bowles and wife Brenda of Troutman, NC, Ernest Bowles of Martinsville, VA and Lois Hyatt and husband Kelly of Iaeger, WV; children, Angie Marshall and husband Mike of Wilmington, NC and Thomas Bowles Jr of Avondale and fiancée Celena; daughter-in-law, Tina Hyatt of Bradshaw, WV; grandchildren, Tara Bowles Laxton and husband Jonathon, Ashley Marshall and husband Josiah, Brianna Bowles and Matthew and Brandi Bowles; great grandchildren, Madison Horne, Jonathan Laxton II, Kyler Bowles , Kyndal Laxton and Layah Grizzel; and numerous additional family and friends. Tommy found his life and joy in his large and loving family to whom he has been a rock and role model for many generations and will be remembered for many generations to come. While the family mourns the loss of this humble, charming, intelligent, funny and loving man we rejoice in his fulfilling eternity with our Lord in Heaven. Please join us in celebrating the rich life of Thomas Bowles, our cherished family patriarch. Funeral services will be conducted Thursday, February 7, 2019, at 11 o’clock with Reverend Danny Bowles and Reverend John Wheeler officiating at the Chapel of Fanning Funeral Home in Iaeger, WV. Burial will follow in the Bowles Cemetery at Mile Branch Hollow near Avondale, WV. Serving as pallbearers will be family and friends. Friends may visit with the family Wednesday evening, February 6, 2019 from 6 to 9 p.m. at the Chapel of Fanning Funeral Home in Iaeger, WV. To send flowers or a remembrance gift to the family of Thomas Elmer Bowles, please visit our Tribute Store. "Email Address" would like to share the life celebration of Thomas Elmer Bowles. Click on the "link" to go to share a favorite memory or leave a condolence message for the family.